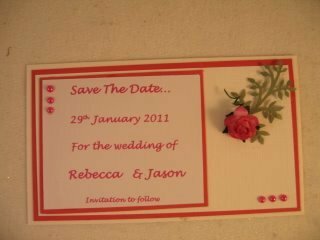 Save The Date is one of the additions to your Wedding Stationery that can be made and sent well in advance. This card is the fore runner to the actual invite and can be sent many months in advance. But if your wedding is only a short distance in the future, or perhaps cash is short, then this is one of the things that can be dispensed with. They don't really need an RSVP attached to them as an invitation will follow on and then your guests can make a firm commitment to attend your wedding. 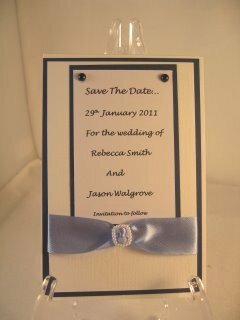 A plain white or cream card for the base is always an elegant way to start. Good quality card is essential and can be bought in many places. Mat and layer it with gold or silver and it is sure to be a winner. 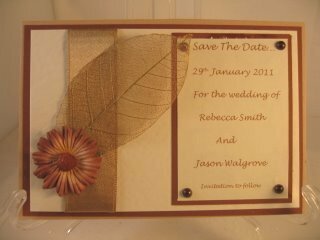 It can then be dressed up with a hint of the colour to be used...say for the bridesmaids dresses, or the floral bouquet. With the addition of Flowers..... Charms..... Gemstones..... or any other Embellishments that you have in your stash you can make these cards as individual as you want. But before you start to make them just ask your self ....."will the invitations be going out in the next few months"
And if they are do I really need to spend more money on Save The Date cards as well. 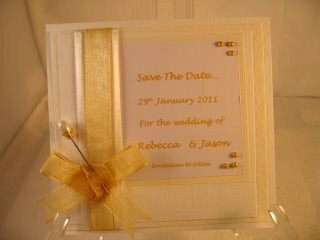 they can be an extra expense that could well be used for other things that you may need and quality card is not cheap. You may need a lot of it if this is going to be a large wedding and of course every item that you make is time consuming. And I know I said it earlier but KEEP IT SIMPLE. Use quality items and give your self plenty of time to make everything that you need. 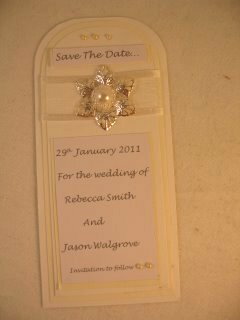 And if you can save some time and money by eliminating Save The Date cards from your to do list then this is something for you to consider.